There’s a question that’s been running through my mind for quite a few weeks now which I thought I would put to you today. Please answer as I think it would good to see what everyone thinks. 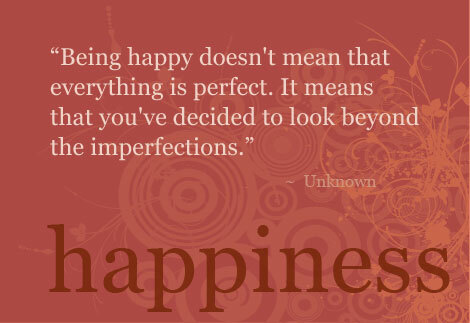 What does happiness mean to you? Is it in seeing others happy or making them happy by doing everything you can? Is it helping the world become a better place. Is it sharing your own happiness? As you can see there’s many reasons but how often do we think deep enough to define happiness? For me happiness is inner peace and tranquillity which seems to elude me always.. that doesn’t mean I’m always grumpy, quite the opposite in fact but to truly reach that point where I can say I’m really happy is to truly have inner peace for myself. Be able to sleep easily without any worries or tensions. So what does happiness really mean to you people? I love this story and remember the first time it was ever told to me… I made a decision there and then that I would wake up every morning and think positive and sadly I think I’ve let myself down many times. Many a morning I’ve woken up, groaned and thought ” oh no, not another day!” turned over and gone back to sleep. It would be amazing to be able to think like this lady in this beautiful heart warming story and enjoy each day without thinking negative at the start of your day, moaning and groaning about the all the things that are wrong in life and ignoring what’s good. The 92-year-old, petite, well-poised and proud lady, who is fully dressed each morning by eight o’clock, with her hair fashionably coifed and makeup perfectly applied, even though she is legally blind, moved to a nursing home today. As she maneuvered (an action, especially a devious or deceptive one, done to gain advantage) her walker to the elevator, I provided a visual description of her tiny room, including the eyelet sheets that had been hung on her window. “I love it,” she stated with the enthusiasm of an eight-year-old having just been presented with a new puppy.